2. 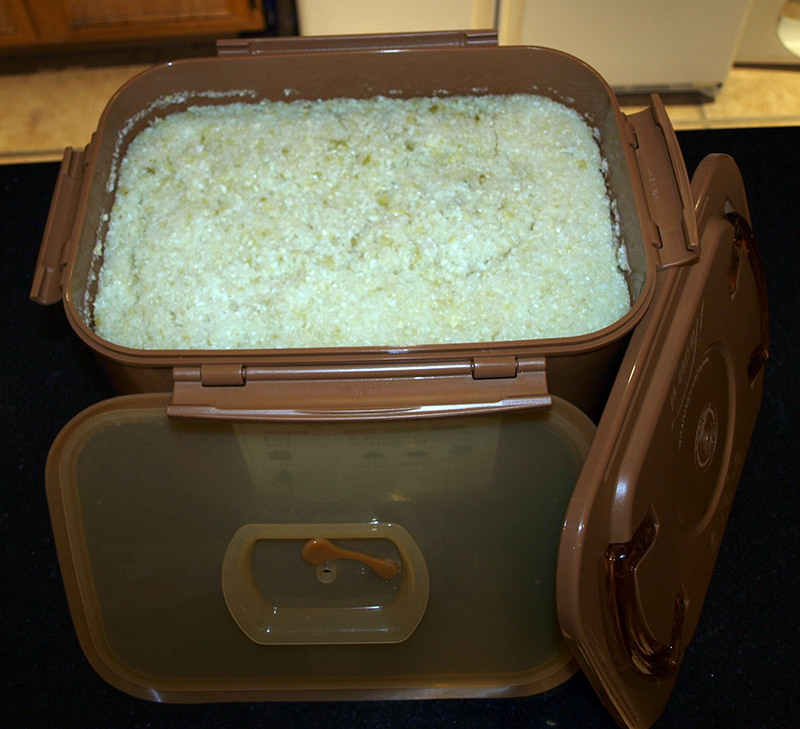 A fermentation container – The container doesn’t have to be fancy, but it will need to be covered, as fermenting cabbage juice is an anaerobic process (no oxygen). 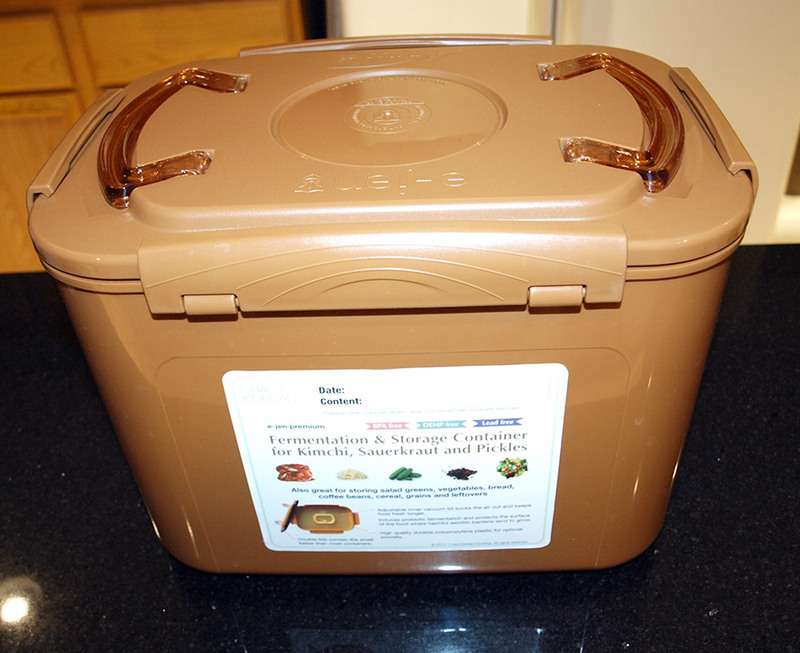 The container should hold about six liters, although one can easily adjust the amount of cabbage juice one desires to produce to ‘fit the container’. UPDATE: You can use actual fermentation containers. Use about 2-3 medium sized cabbages in this 8 Liter container available via Amazon.com: Fermentation Container. 3. Two heads of cabbage – organic preferred. 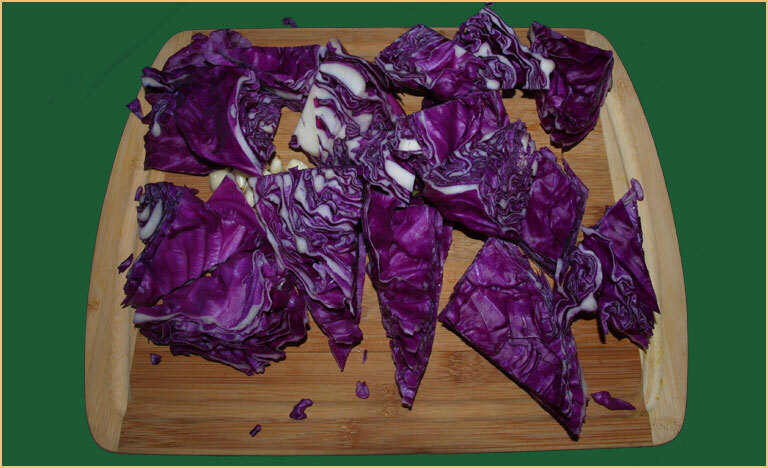 One may use red or green cabbage, or a combination of both (as will be explained below). 4. 1/2 bulb of fresh garlic – Trust me, it makes the whole process better: Better fermentation, better tasting, and more nutritious! 6. Good quality purified water or high quality spring water… nothing antimicrobial. To start, slice one head of cabbage into two, and set one half cabbage aside. To make it easier to fit into the blender, always chop up the cabbage into smaller pieces just prior to placing the cabbage into the blender. Each blender batch requires 1/2 head of cabbage. Therefore, one head of cabbage will require blending twice. Begin by adding roughly one liter of water into the blender. Next, place 1/2 bulb of garlic into the blender. Then, add the chopped cabbage. You may have to partially blend some of the cabbage in order to fit the rest in. 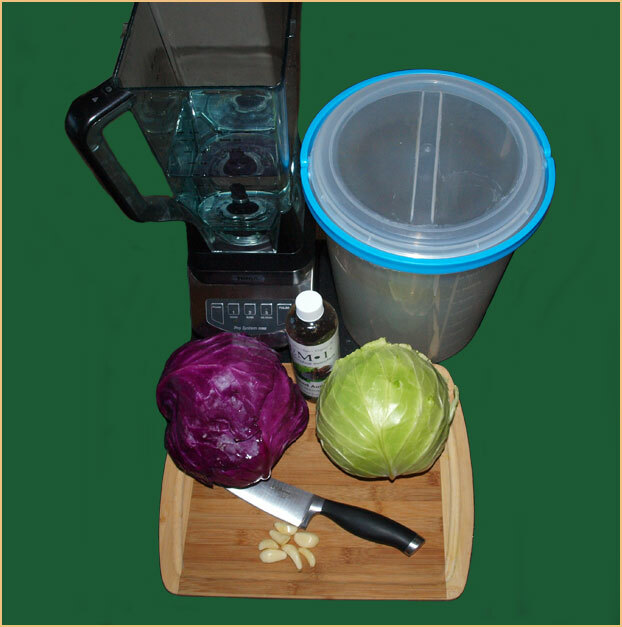 Once the full half head of cabbage is in the blender, blend on high for one full minute. From the blender, pour the blended cabbage into the fermentation vessel. Next, repeat step one for as many half-heads of cabbage as you’d like to make. We recommend making the equivalent of two full heads of cabbage juice per fermentation batch, which should be somewhere near six liters of blended cabbage and water. If there is a bit more or less water used, it is just fine. Finally, once you’ve completed steps one and two, give the whole thing a few good stirs with a large spoon or stirring rod. This is especially important if you (optional) decide to add Effective Microorgansims, SCDs, or Kenetic Starter Culture. Adding your own microorganisms is one way to improve the quality of the probiotic blend. Once completed, simply cover the fermentation vessel so that it is close to air tight. If you over-compress the lid, it, too much pressure might built up and the container may start to leak. If you place the lid on the container too loosely, this will result in too much air inside the container. Luckily, you don’t have to get it perfect in order to make a high quality batch. There is plenty of room for forgiveness. Leave the whole thing alone at room temperature (75 degrees F “ish”) for three full days. If desired, you can ferment a bit longer, up to five days. The last step in preperation is straining. 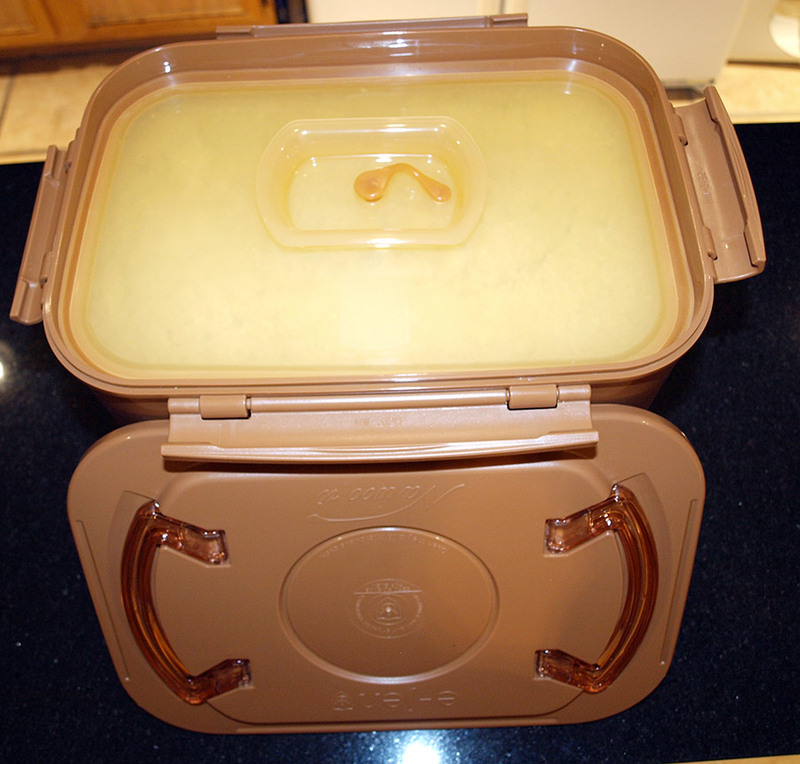 Before use, you will need to strain the juice into clean containers with lids for refrigeration. One may use a metal strainer, or cheese cloth. The fewer the large fibers in the end cabbage juice, the better the taste. Refrigerated fermented cabbage juice will easily last weeks. For best results, one half cup should be consumed with each meal. For individuals with very troubled digestive systems, one may wish to build up slowly. The greater the reaction upon starting cabbage juice (rumbling, gas, etc. 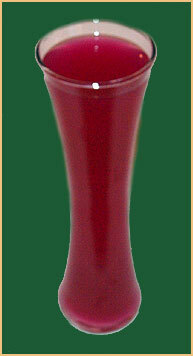 ), the more the cabbage juice is needed. Individuals who are able to stick with it through the adjustment period should have stabilized digestion in about six weeks of use. Fermented cabbage juice should always be refrigerated and used within three weeks of fermentation. Why the Green and Red Cabbage? You can make fermented cabbage juice using only red cabbage, but the digestive healing effect will not be the same. The fermented brew will be more nutrient-dense, less probiotic dense, and have a sweeter, more potent taste. You can make fermented cabbage juice with only green cabbage. It will have a much stronger smell, but a very light taste, and act as a very powerful probiotic drink. Combining the two is fun and colorful, and one gets a mix of dense nutrients and powerful probiotic action. I encourage individuals to experiment with ratios to find a blend that best suits them. For individuals who simply want the drink with the highest amount of probiotics, use green cabbage alone. As well as being super healthy and anti-pathogenic in its own right, the addition of raw garlic to the fermentation process will speed up the “destruction” of the “bad” microbes that naturally occur in the cabbage. While the lactobacteria will eventually dominate the common unhealthy microbes in the cabbage while fermenting, the garlic makes certain this occurs in the three-day time period. Why do we use Effective Microorganisms / SCD? We add about one ounce of Effective microorganisms to each brew. EM’s and lactobacteria are very compatible. While “effective microorganisms” are actually a self-sustaining ecosystem made up of several microbes, the sole purpose of the ecosystem is to preserve a very rare type of microbe called a photosynthetic microorganism. While not commonly used in the United States or the western world in health, in Japan, these amazing microbes have shown great promise for a myriad of health promoting uses. To give one example, these microorganisms eat what to us is waste products, and in return, they produce antioxidants. They are extremely resilient in anaerobic environments, and can out-compete most pathogenic organisms for food. They also feed on dead fungi. They make a perfect and harmonious addition to the fermented cabbage juice process. When you cultivate these organisms on their own, they are a brilliant purple color, just a bit lighter in color than the purplish fermented cabbage juice image above. Any one interested should really obtain and read the book(s) of Dr. Higa. Hi, Jason. I’m wondering if you can tell me what size bottle of the EM you use per batch? They sell several different sizes. Thanks for all your help! What is “capful” as tsp or other measurement? Thanks. …about one to two ounces is a very plentiful amount. You’ve linked to a page at Teraganix. I’m aware of the controversy surrounding over-using soil organisms in farming, but that is a completely different issue. If you’d like to post to a link to any controversy, I’d be glad to review it. However, if you were to read Dr. Higa’s books and come to an understanding about what EM’s really are, you probably wouldn’t be concerned. It is mostly about farming, but at the end he talks about consuming it. The observations of the individual posting about EM’s is about the over-use of EM’s for soil recovery. The above is obviously a false statement. Effective Microorganisms (I don’t know about the other thousands of formulas used NOT developed by Dr. Higa) are not widely used in North America, Europe, Africa, or the Middle East. They are correctly used in Japan, and many other non-English speaking locations with great success. The individual also implied that no studies have been done with EM’s, which is not true. No studies have been presented to the FDA. EM’s have been studied widely (see Dr. Higa’s books, not, as the author of the post indicates, his “pamplets”). Blaming EM’s for a hospital-derived, antibiotic resistant flesh eating Staph infection borders on true incompetence. I’ve seen the combination of natural probiotics, EM’s and clay help to heal a few individuals who would most likely be dead otherwise. The choice, of course, to use or not to use EM’s, clay, and fermented foods, is up to the discretion of the individual. You’ll notice that all of my articles on the digestive system are geared to restoring balance to the bio-terrain of the digestive system by changing the terrain in order to allow and assist healing the digestive system, not simply using a single substance as a “cure”. Thanks Jason. I have seen on the GAPS yahoo group that many people have used EM’s with success. I’m not too worried, as nearly everything I have tried, someone somewhere is adamantly opposed to it. I don’t usually worry when it’s the FDA opposed 🙂 Your clay has helped me a great deal. Thanks! I made some without the EM’s for now, but I’m not sure if it worked. Do I not need to add any sort of bacteria if I’m omitting the EM’s? I have made sauerkraut lots of times, and I know cabbage is naturally full of bacteria. But I thought the salt helps it ferment. This stuff has been fermenting for 3 days, and it smells – well, not completely disgusting, but sort of gross. I don’t care for the smell of sauerkraut, though, either. I’m just wondering, as you said the EM’s are optional. Thank you! You do not need to add either salt (like you do with sauerkraut) or any other bacteria culture. And, yes, it is supposed to smell. I’m beyond excited! Day#2-saliva 7.0. I ordered the EMs but don’t know how much to add. Please advise. …you only need a capful of the EM1 culture per batch of cabbage juice. Hello! What kind of container do you use for the fermentation? Also, is it 1/2 bulb of garlic for every 1/2 head of cabbage? Or 1/2 bulb of garlic for 2 heads of cabbage? …just 1/2 bulb for the entire brew. Hi Jason: could you freeze the juice in ice cube tray for later use or would this undermine probiotics? Can the type of water to be used be ‘filtered’, or does it have to be mineralized ( as per your “spring water” recommendation) as well? Thanks. I personally would not freeze the microbes; one of the ideas behind doing a fast fermentation is to really get the “probbies” awake and active. Yes, you can use filtered water. 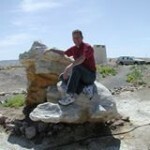 Hi Jason: I cannot find any eBooks by Dr Higa on Amazon. The only paper book on Amazon is very expensive costing around $30. Do you have any recommendations for sourcing or substitute ebook which discusses Dr Higa’s research and protocols. Thanks. There isn’t much writing in English about the use of EM’s for human health. No Ebooks that I’m aware of. Hi ive heard that this should not be used if you have thyroid problems. Do you know why? Im thinking of using it as my digestive system is pooped after having h.pylori for alit of years. I need the probiotics and were use of antacids have been used its obvs upset my stomach acid. I do have multi food intolerances and a massive dairy alergy so pprobitics are a issue for me to take. The last thing i need is a negative effect from taking this juice. Any advice would be great. If you’d like to provide a link to an alternative view, I’d be glad to take a look at it! The idea that fermented cabbage juice supresses thyroid function is just a well intentioned misconception. Most fermented vegetables have a higher concentration of goitrogens which can depress thyroid function. One of the benefit of the ***short*** fermentation method used to produce cabbage juice is that it is one of the only fermented vegetables that does not have high levels of goitrogens. Therefore, while eating raw cabbage or sauerkraut is contra-indicated for hypothyroidism, drinking the fermented juice of cabbage is not. This is probably why fermented cabbage juice is GAPS approved. Like anything else, let your own body be your guide. The adjustment period for fermented cabbage juice is about two weeks. If, after two weeks of regular use (as directed), you are still experiencing problems adjusting to it, then it may be time to investigate further. Some people have a sulfur intolerance that needs to be addressed. I just bought a 3-liter “canning jar” (because they seal airtight), and I’m a bit unsure now about whether this was a good idea, because the your article suggests using at lease a 6-liter container. Will canning jars work (I’m asking because I feel just a bit more at ease about using glass, instead of polypropylene, which could still still contain “BPS”–a cousin of BPA which is comparably harmful, but because it hasn’t gotten any publicity, manufacturers don’t address it). Also, you mentioned of adding garlic, but there’s no mention of exactly how much garlic in relation to the cabbage. Could you supply me with a ratio? Finally, what can you tell me about the efficacy of cultured cabbage juice for restoring one’s gut if they’ve had candidiasis for a long time? I just re-read your article. I was originally reading it with my Android tablet, and somehow missed where you indicated how much garlic to use in relation to the cabbage. I found it now. You can absolutely use glass to ferment. Although I don’t usually experience that much gas build up, you might if you use a glass container, so I would just completely loosen the canning jar lid once daily. Cabbage juice is excellent to help reduce Candida in the gut. However, if this has gone systemic, you may need a much more thorough protocol. You can use a stainless steel vessel to ferment with. I would not add any sugar. Individuals with digestive issues should consider limiting the amount of sugar consumed. It would serve no good purpose to add any sweetner to fermented cabbage juice. Hello Jason. I wrote those comments 3 years ago about the concern for EM’s. I have made progress with my digestive health (which was destroyed on GAPS intro), but I still have a ways to go. I think I am probably brave enough to try the EM’s now in this drink. However, I could have sworn a while ago I thought you said in your article you no longer recommend EM’s. Was I dreaming? I pop on your website a few times a year and just read around, and I really thought I saw a new cabbage juice post that didn’t talk about EM’s. But I can’t find it. Thanks! Yes, you can certainly use EMs! We do. Jason, I tried to email you but it said your email is no longer valid. I read about a pilot study you are trying. It said you are no longer accepting applicants. I was wondering if I can get my hands on the basic protocol information? Everything you have suggested so far I try has helped me a lot. But I have a long ways to go. I was also wondering if there is a far infrared sauna you recommend. I know you have talked about using far infrared, but I didn’t know if you use just a lamp or a sauna. I have been helped by heat therapy by spending lots of time in a steam room so I thought I would try an infrared sauna. Thanks for all your work. It’s valuable and important. I do not have a preference for an infrared sauna. I personally choose to use a steam sauna with medical grade ozone for detox and heat therapy. However, this therapy IS a bit involved, whereas a far infrared sauna is pretty simple to do! I use far infrared for targeted applications with a TDP mineral clay lamp and jade stone pads. There is still much work to do on the comprehensive detox and digestive system restoration program. I’m currently taking a break to do rewrites and “re-thinks”! Would the antibiotic qualities of the garlic kill the probiotics if used in the cabbage juice fermen? No. We’re not using enough garlic to impact the entire brew. Just got out of hospital for one bleeding, one not ulcers in the duodenum. Have been put on pantoprazole twice a day. I am not comfortable with shutting down all my acid pumps. I have been learning about sauerkraut, and sauerkraut juice and want to make them part of my ‘everyday’. Can I eat and drink the sauerkraut while I am taking the Rx? It’s only been four days that I’ve taken the meds, so am a little concerned about not finishing at least one round of the script. What would be your suggestion? Fermented cabbage juice, sauerkraut, and kimchi (my favorite) should all be considered healthy foods. You can use them even while on most medications (there are no contraindications that I am aware of, at least). Adding them into your daily routine is a great idea. I can’t advise you on whether or not to take the medication that you have been subscribed! Thank you…as long as I can do the two together. Then will continue with the sauerkraut and/or juice regularly after this Rx is done. I just wanted to make sure that one wasn’t fighting with the other. Thanks again for your help. Is it supposed to do this or is my container defective? AND is it stil safe to drink? …if press down too hard on the “top” which “seals” the fermentation, I suppose it might leak due to pressure. I would simply decant (remove) the very top portion of the cabbage before straining. Thank you got your response. Am I then supposed to leave a tiny gap of air space when I close the inner container, so that when expansion happens the air goes out first? You can if you’d like. I have found that simply not over-compressing the brew is enough. I used the same container plus another similar product made by Krazy Korean on Amazon. I also found a Krazy Korean YouTube video indicating to leave the air hole on the inner lid open to let out fermentation spillage which you can blot off before lifting the inner lid. Worked well for me.